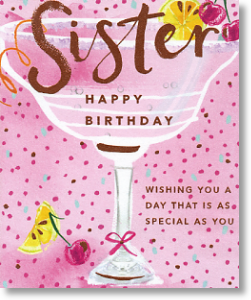 A gloriously bright and cheerful Sister Birthday card! Say 'Cheers' to the special Birthday girl and have a cocktail to celebrate the day. The front design is delightfully pink and has gold foil writing and detail to add extra shimmer! Inside has a full colour print with little pictures of different cocktails and fruits - a very tropical feel!